I have always had a passion for Victorian Ladies Hats, mainly because I love vintage and I can’t wear hats as I look gaudy in them. These pincushions give me the chance to explore my vintage creative side and make something useful at the same time. 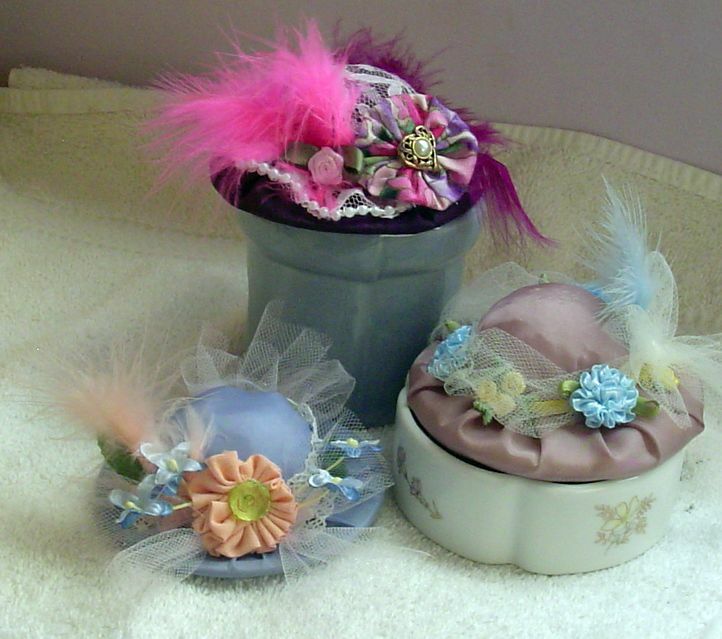 Pincushions are fabulous items to make and creating one is always received with delight and joy. I have hand sewn the top to the brim and some of the embellishments are also hand sewn as well for extra security. These 3 wide brim hats are inspired from the Lady Diane website who fashions gorgeous hats for very special occasions like The Kentucky Derby. Diane truly has a flare for designing and creating these works of art. Drop by her website and see for yourself. I am exploring into creating different styles such as the Small French hats and Teardrop styles as soon as I can find the appropriate materials for them. I will probably pick up my crochet hook and make them myself. I am also looking into little doll pincushions as well. I have a picture of one and she looks wonderful. Can’t wait to get my supplies together for one of these. Don’t forget that these pincushions can be purchased from my online shop, JILLYS STUFF. Back to the creating desk now. Keep watching for more pincushion creations from Jillys Stuff.